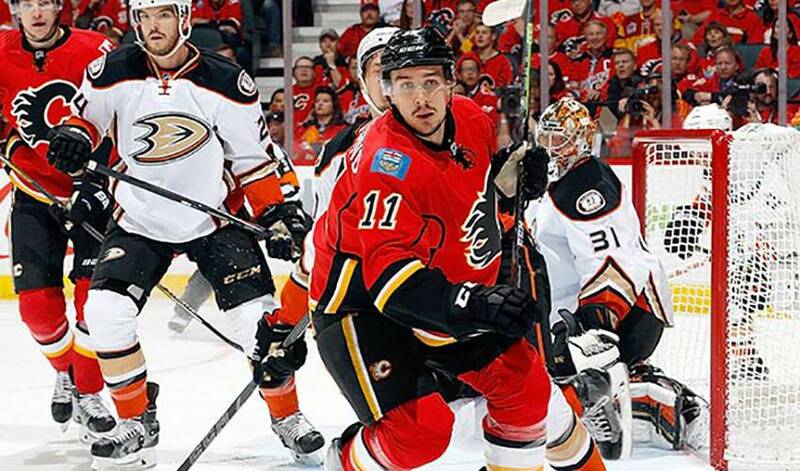 Mikael Backlund’s extra effort on Tuesday night extinguished a 2-0 series deficit for the Flames and put them back on the winning track against a mighty Ducks squad. Knotted at 3-3 after regulation, it was Backlund who played the role of overtime hero for Calgary, netting the winner at 4:24 of the fourth period in front of a delirious Saddledome crowd. It was the first goal of this year’s playoffs for the centreman, who is seeing his first NHL post-season action in 2014-15. STAT PACK: 24:46. Backlund’s ice time was tops among all Calgary forwards. NEED TO KNOW: Backlund is a huge supporter of charitable endeavors in both Calgary and his native Sweden. He was honoured for his efforts when he was named the 2014 recipient of the Flames’ Ralph T. Scurfield Humanitarian Award. LOOKING FOR A GOLD RUSH: Backlund has represented Sweden several times in international competition, winning three silver medals, including in 2011 at the World Championships, as well as three bronze medals, including last year at the same event in Belarus. MILESTONE MOMENT: On January 28, 2010, Backlund scored his first NHL against the Phoenix Coyotes. ROCKET MAN: Playing for the Kelowna Rockets in the 2009 WHL playoffs, Backlund tied teammate and fellow NHLer Jamie Benn for the league lead with 13 goals in 19 games as Kelowna defeated Calgary in the final to win the Ed Chynoweth Cup as league champions. HONOURABLE MENTIONS: Corey Crawford made 30 saves as Chicago won 1-0 and took a 3-0 lead in their series against Minnesota. Patrick Kane had the lone goal in the Blackhawks’ victory. Johnny Gaudreau tied the things up for the Flames with just 19.5 seconds left to play in the third period.